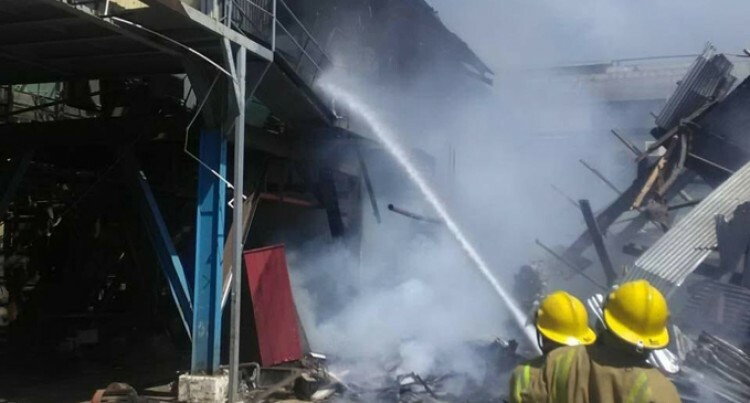 National Fire Authority officers trying to contain the fire at the Fiji Sugar Corporation’s Penang Sugar Mill in Rakiraki on September 20, 2018. Fiji Sugar Corporation began disman­tling the Penang Mill soon after its closure was announced in 2017. This followed a survey designed to identi­fy useable equipment and materials which have since been dismantled and re-located to the remaining mills in Viti Levu and Va­nua Levu. What remains is the mill structure and civil foundations which in their current state are a severe safety hazard to workers and people straying onto the site, which the Corporation is addressing by demolishing what remains.The demolition works were awarded following FSC tender require­ments, and all necessary permits and ap­provals have been obtained. 1.Who is the contractor involved in this pro­cess and how long is the total dismantling process expected to take? FSC: The contractor awarded this work is a specialist Korean company – Messers Sam Gi Tech Ltd. The same company also won a tender to remove scrap material from the Lautoka and Rarawai mills before the start of this season. The demolition contract is for a duration of 3 months. Will the parts be reused or sold? FSC: All equipment and materials re-locat­ed to other mills has been transferred at book value. Scrap metal from the demolition is being purchased by the contractor at commer­cial values based on international pricing for ferrous and non-ferrous material. Necessary checks and controls on weights and measures have been put in place by FSC. This also applies to scrap sold from the Lautoka and Rarawai mills. 3.What will the Penang mill site be used for? FSC: Several approaches have been made to FSC for use of the Penang Mill Site. Detailed evaluations are undertaken by FSC on each approach to ensure credibility is assured and that the site will be put to good commercial use, as well as be of ben­efit to the Rakiraki community. FSC is currently working on two such op­portunities for the Penang Mill Site, both of which would require a clean site to be made available for project development. Once a successful project has been se­cured, FSC will release details for the site utilisation. 4.There have been concerns raised about the workers that used to work at Penang – have they been re-employed? FSC: Workers who previously worked at the Penang Mill continue to be employed by FSC, but are now mostly being deployed to the Rarawai and Lautoka mills. During the crushing 38 are engaged at Rarawai Mill and 10 at Lautoka Mill.